Now that it stays light later we can finally go outdoors for our Tuesday night Urban Sketching sessions. 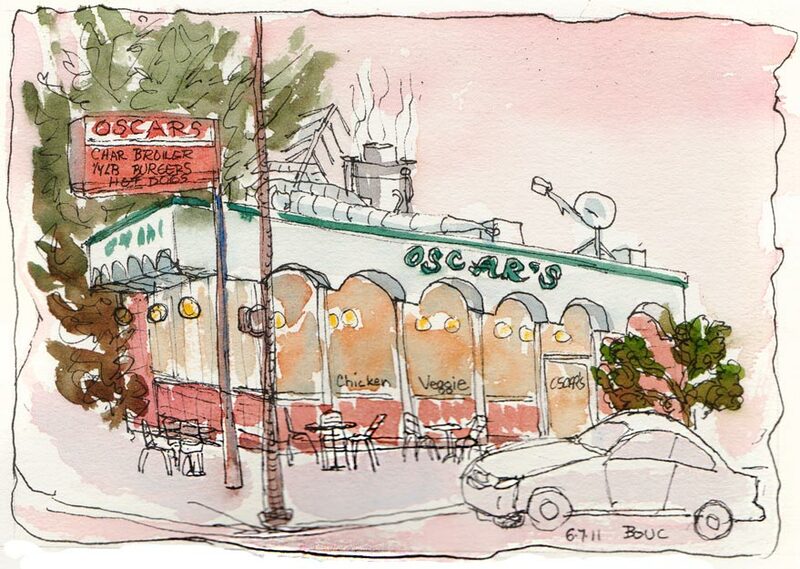 We met at the corner of Shattuck and Hearst in Berkeley and I sketched Oscars Charbroiler from across the street. They’ve been grilling burgers, hot dogs (and now vege burgers) over fire on that corner since 1950. It was sunset by the time I painted it, hence the pink sky. When we went inside for one more sketch. There was a big screen TV on the wall tuned to sports. 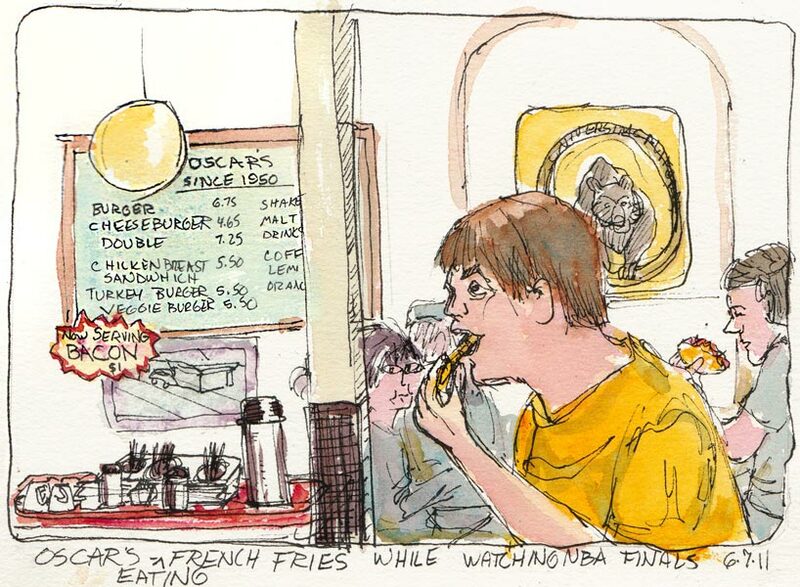 It was the end of an NBA playoff game and people were watching while stuffing their faces with burgers and fries like this guy who never looked at his food, just shoveled in the fries while watching the game. Another guy came by and complemented our drawings and asked if we came there every week to sketch. Uh, no…maybe once a decade? Though I have to admit I’d skipped dinner, got hungry, and ate one of their burgers. It was good. Great depiction of the guy shoveling the food in. If this is where I think it is, then my favorite brewery (Triple Rock) is right down the street. These drawings are making me hungry! Wow the tables outside are a new feature (to me at least). There is so much traffic on that corner it would be uncomfortably crowded I think. However seating inside can get toasty with the grill going and all those windows in the sun! At lunch time (when I worked in Berkeley) it was always a line out the door for orders!